Albert Miller is arguably one of the Greatest Fiji Athletes ever. This can be supported by the fact that he was the South Pacific Decathlon Champion for three successive Games with silver to back it up at his fourth Games, with record breaking performances. Albert won this event in 1983 Samoa Games, with a total of 6870 points, then again in New Caledonia in 1987 with 7019 points and then in Port Moresby in 1991 with 7265, with a silver in Tahiti, in 1995. His performances in the region have not been matched for over 24 years and Albert continues to hold the National Record, South Pacific Games Record and the South Pacific Best performance in Decathlon. Albert represented Fiji at the Commonwealth Games in 1986 in Edinburgh, where he finished in 10th place overall, against top Decathletes like the then World and Olympic Champion and Record Holder Daley Thomson. Albert was also a member of the most successful Fiji relay team ever in the 4 X 100m which finished 4th at the Edinburgh Commonwealth Games. Albert participated at 3 Olympic Games, with very competitive results. In 1984 – did not finish due to injury sustained during the competition; 1988 – Seoul with 7016 points in 32nd place and then in 1992 in 24th place with 6971 points. Although Albert was renowned for his exploits in the Decathlon, he was also as competitive in the 110m hurdles. He has won two silvers and a bronze medal in the 110m hurdles during the 1983, 1987, and 1991 South Pacific Games. In 1983 Albert competed in the National Collegiate Athletics Association (NCAA) Div II National Championships, in the USA while representing California State University of Sacramento (CSUS) where all the top athletes in the sport of Track and Field from throughout the USA competed. Albert finished 3rd overall with a score of 7455pts, establishing a new South Pacific best score and a new record for the California State University of Sacramento. 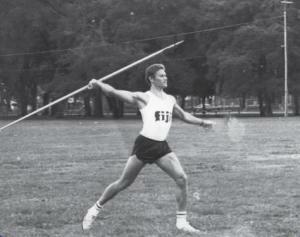 Due to his success at the 1983 NCAA Championships, Albert was inducted into the Sacramento University Hall of Fame and was also the recipient of NCAA All American award. Albert has dedicated 24 years of his life representing Fiji and assisting in the development of the sport of Athletics. He is currently the Hon Secretary of Athletics in Fiji. In recognition of his unequalled performances and commitment to Athletics, FASANOC is proud to induct ALBERT MILLER into the FIJI SPORTS HALL OF FAME.